Founded in 1949, The Orcas Island Sportsmen Club (OISC) is one of the oldest private, non-profit, community organizations on the island. The OISC presently offers a range of shooting programs for both the membership and non-member public. 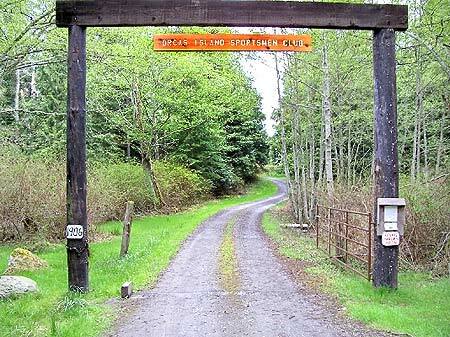 OISC is located two miles west of Eastsound on Enchanted Forest Road, and includes shotgun sports fields, a large-bore rifle range, a sheltered small-bore rifle and pistol range, and clubhouse. The small-bore range is among the very safest in the State and a Range Safety Officer or Range Master is on duty at all active ranges. We are proud of our tradition of safety, education, conservation, and community involvement. Various disciplines of Trap, Five Stand, small-bore rifle and pistol paper- target shooting and a one hundred yard large-bore rifle range. Free instruction is offered on a limited basis for beginners, including both children and adults. Additionally, OISC hosts special events during the year to which the general public is invited. You are welcome as a visitor! If you would like to come shoot on one of our ranges, or perhaps learn more about membership in the Club, come anytime during range hours, call the club at 360.376.5660 or e-mail contact@oisc.info or more information.